We are an independent opticians based in Skewen, between the Neath and Swansea border. We are located 30 yards opposite Crescis Café. We strive to offer you Customer Service and Quality products what ever your financial budget. We pride ourselves in Customer Service. Our Eye Examinations are thorough, the Quality of our frames and lenses have been tried and tested by our experienced staff, to ensure we are happy to provide a service that we would want to recieve. 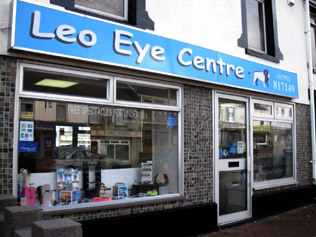 At Leo Eye Centre, our Optometrists are able to carry out Wales Eye Care Scheme assessments. This service is to make eye health a priority in Wales reducing the demand on hospital eye service. Low Vision Assessments are carried out for patients who require special visual aids. As an independent opticians we have tried to ensure that we provide for every budget. With standard spectacles starting at £39.95 we have a selection of frames for qualifying NHS patients to Designer frames to suit all budgets. If you require a specific spectacle or contact lens we should be able to assist you.